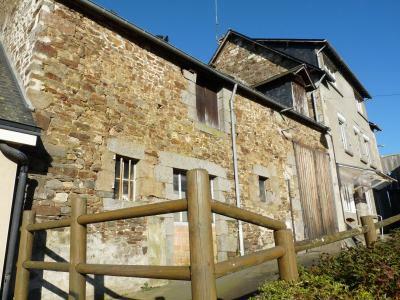 A great location in the countryside halfway between Ernee and Fougeres, in the countryside but not isolated, property including a dwelling house of about 65m² on the ground on 2 levels attic. Currently equipped kitchen with wood burning stove, bar on the back, bathroom, living room, 3 bedrooms, WC. 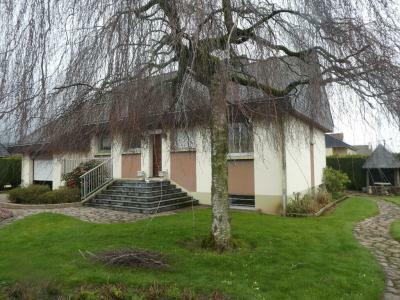 Adjoining garden (400m²). GROUNDS OF ONE HECTARE with outbuildings (Ideal stables for horses). Wells (some renovation works required for connection communal water and sanitation standards). Ground floor: entrance, fitted kitchen with wood burning stove (19m²), rear kitchen / bar (17m²), bathroom, WC and storeroom. First floor: landing (direct access to the south facing garden), living room with parquet floor (19m²), 3 bedrooms (approx 11m², 15m² and 10.5m²), WC. Attic: suitable for conversion over all (for the moment accessible from the outside). Wood and electric heating. PVC windows. Wells feeding the house (no communal water, right of drawing on neighbouring plot). Attached garden of approx. 400m² exposed south. Land of more than one hectare with barn and shed. Septic Tank to bring to the standards.